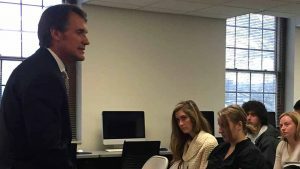 Peabody and Emmy Award-winning journalist, David Mattingly speaks with UA students on J-Day, 2016. UA’s College of Communication and Information Sciences’ will host its annual Media Day on March 2. Sponsored by the department of Journalism and Creative Media, Media Day is an annual program highlighting many of the career paths available for students majoring in creative media and news media. Students can hear guest lectures and interact with the guests participating in the panel discussion. This year’s media day features an abundance of Alabama industry professionals in fields such as broadcast news, talk radio, media production, sports writing and journalism. Media Day events are open to the public and will be held in the college’s Digital Media Center, housed in Bryant-Denny Stadium, from 10 a.m. to 4 p.m. Speakers include Dylan Lard and Cody Eldridge of Pitts Media, Greg Garrison of The Birmingham News, Jon Lunceford of Jox FM radio, Chelsea Brentzel of WHNT-TV Huntsville, John Talty, sports editor for Alabama Media Group, and the winner of the 2017 Clarence Cason Award in Nonfiction Writing, Dr. Patricia Foster. Click here to view full program. J-Day began in 2008 as an initiative to connect journalism students on campus with industry professionals by discussing their work and the evolving industry landscape. J-Day became Media Day when the department of journalism and the department of telecommunication and film merged into the department of journalism and creative media in 2017.